PayPal (s ebay) is organizing its payments products for small business into one larger service called PayPal Payments that is meant to provide an array of tools for online, in-person and mobile payments. The move builds off the recent release of PayPal Here, a rival service to Square targeting small businesses, and combines all the work PayPal has traditionally done online and on mobile. Businesses customers can access all three tiers of services, which include a suite of tools aimed at helping them improve both the payment and shopping experience for consumers. The move is meant to be more than just a marketing maneuver and reflects the future of commerce as PayPal and eBay see it. The companies see that shopping is going multi-channel across physical retail, online and mobile and small business customers are increasingly looking for a single way to address all their needs. “We’ve talked about the blurring of online, offline and mobile, but we’ve talked about that in the large enterprise context. Now, we’re extending that to heart of the company which is small business,” said Peter Karpas, North American vice president of customer engagement at PayPal. In an effort to hammer that message home, PayPal is also removing the word “website” from all of its products to highlight overall payments in a multi-channel environment. The previous services for small businesses were Website Payments Standards and Website Payment Pro. The services will all be PCI compliant for small business customers. And businesses will get full mobile payments support so they can immediately process transactions optimized for small screen devices. PayPal is also stressing the use of a PayPal debit card, which when used by consumers can give them 1 percent off transactions. Online payments – 100 percent end-to-end PCI compliant checkout options that allow you to accept credit cards and PayPal online in minutes with an emphasis on security. In-person, offline payments – ability to accept credit cards, PayPal, and checks in person using your smartphone, a free thumb-sized credit card reader, and app. Mobile payments – Checkout automatically optimized for mobile transactions – giving you an instant way to accept payments on any mobile device. Invoicing – easy to use and customizable invoicing that helps you get paid faster. Invoices come complete with a Pay Now button customers can use to pay, even from a mobile device. Debit card – fast access to cash in your PayPal account, with 1 percent cash back when you sign for purchases. The payment tools will range from a free standard service to a $5 a month advanced tier and a $30 monthly pro service. Some of the differences in plans include the ability to have customers pay without leaving a website and businesses being able to accept credit cards via phone, fax, and mail, a pro feature. Pro users will also be able to design and control their own check-out page. You can check out the pricing and features here. This is all part of PayPal’s big push to become a ubiquitous payment option and business tool. PayPal is playing catch up in certain areas but it has a lot of resources it is increasingly bringing to bear on payments overall. Now, we’re starting to see it all come together into a larger strategy that businesses can take advantage of. One of PayPal’s advantages is that it has a lot of scale already with more than 100 million users. And it’s now applying that across the mobile and in-store payment landscape, going after not just retail but restaurants, gas stations and all kinds of small businesses. PayPal processed $118 billion from more than 100 million users in 190 countries last year, including $4 billion in mobile payments. Not every small business will need all of PayPal’s services. But by putting it all together into one coherent offering, it should help some businesses better take advantage of all the opportunities in multi-channel commerce. Great article Ryan! 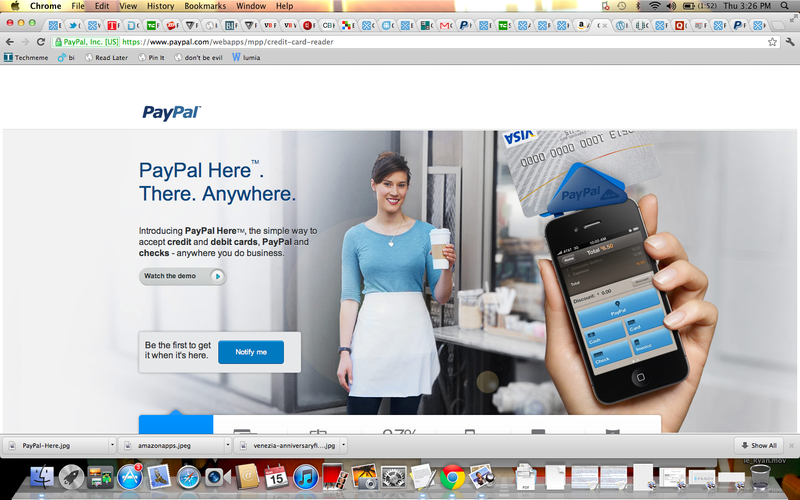 It’s amazing the “shift” that PayPal is making from the desktop to mobile. If you look at a majority of these transactions, however, it’s just a shift. The $4B is not an increase in PayPal’s volume, but a shift from the desktop to the mobile. Very, very little is at brick and mortar businesses. I hope the little triangle is going to help them with that. Brick and mortar businesses need help driving new business or streamline their existing business. Coming from a family of entrepreneurs, whose businesses include dry cleaners, salons, grocery stores and restaurants, itâ€™s been ingrained in me that the bottom line is whatâ€™s key; my father would say that words canâ€™t pay the rent. The goal and mission should be to help level the playing field between large company’s like the eBay’s and the Amazons (who have put local businesses out of business) and local brick and mortar businesses. Looking forward to having you experience GoPago in San Francisco.